Alina Residences is one of the newest luxury condominium developments currently in the preconstruction phase in Downtown Boca Raton, FL. This artfully designed community by El Ad Group is located at the site previously known as Mizner on the Green, where the Boca Resort golf course meets the chic, urban setting of Downtown Boca Raton. This highly anticipated project will launch with the development of the first of three nine-story buildings and more than 32,000 square feet of private outdoor space & amenities. With a coveted location in the heart of Downtown Boca Raton, an unparalleled selection of residences, and a unique offering of lavish lifestyle amenities, Alina Residences promises to be one of the most impressive new residential condo developments in Downtown Boca Raton for years to come. Development of Alina Residences Boca Raton will launch with the first of three nine-story, contemporary towers, which is expected to be ready for occupancy by the end of 2020. The first building will feature 121 ultra-luxury condominium residences, 102 of which will be offered fully furnished. The first building will also include twelve penthouse units and seven exclusive first-floor villas featuring expansive lanais and private gardens. 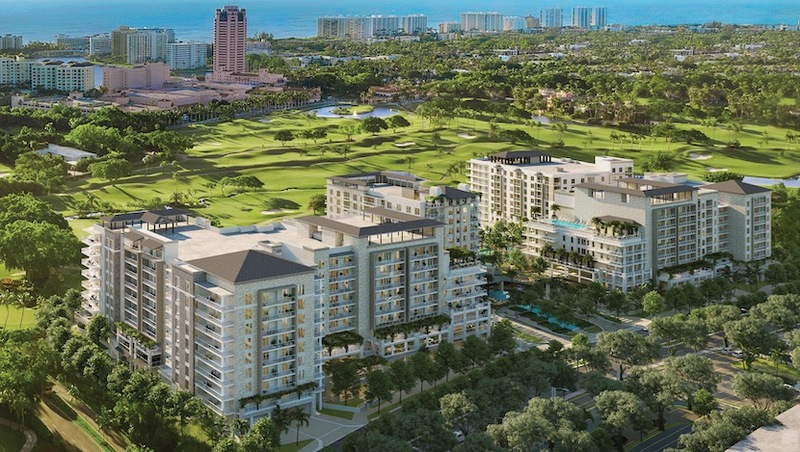 Situated at 200 SE Mizner Boulevard, Alina Residences is located at the site previously known as Mizner on the Green, directly adjacent to the championship golf course at the world-famous Boca Raton Resort & Club. Residents will enjoy the convenience of being able to walk to many of the best shopping, dining, entertainment, & nightlife options in Downtown Boca Raton, including Mizner Park, Royal Palm Place, & the Boca Raton Museum of Art. This premier downtown location is also just minutes from the pristine local beaches, the Intracoastal Waterway, and several beautiful nature parks, truly offering residents the best of both worlds. For those seeking the ultimate luxury lifestyle in a vibrant downtown setting, Alina Residences in Downtown Boca Raton may be the perfect new place to call home! If Alina sounds like the right match for your desired lifestyle, you may also want to visit other new luxury condo developments in Downtown Boca Raton including Tower 155 & 327 Royal Palm, both of which also offer ultra-luxury condo living in heart of prestigious Downtown Boca Raton. If you are interested in purchasing a new construction luxury condo at Alina Residences or any of the surrounding downtown condos in Boca Raton, please contact us at 561-235-7800. You may also reach us by completing our brief online contact form provided below and one of our Boca Raton luxury condo experts will reach out to assist you. We at Champagne & Parisi Real Estate look forward to assisting you in finding your next dream condo in the heart of Downtown Boca Raton, FL!